The holiday season is in full swing. Children’s Christmas lists are getting longer, families are trimming their trees, holiday parties are already underway and folks are making final arrangements for their Christmas travels. It’s traditions like these that fill our hearts with memories. This year, why not add something special to your list of holiday traditions? 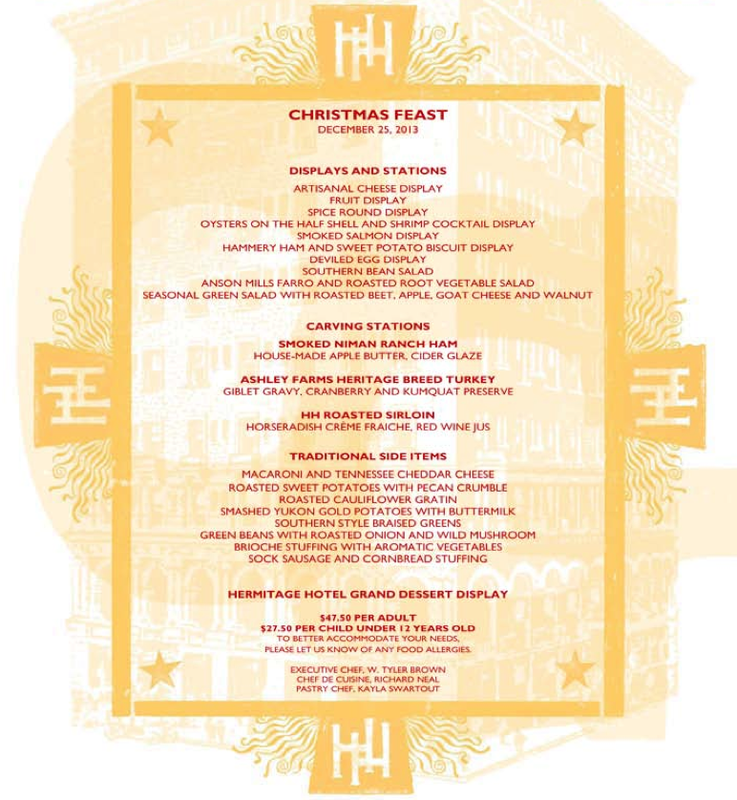 Celebrate Christmas with The Hermitage Hotel. 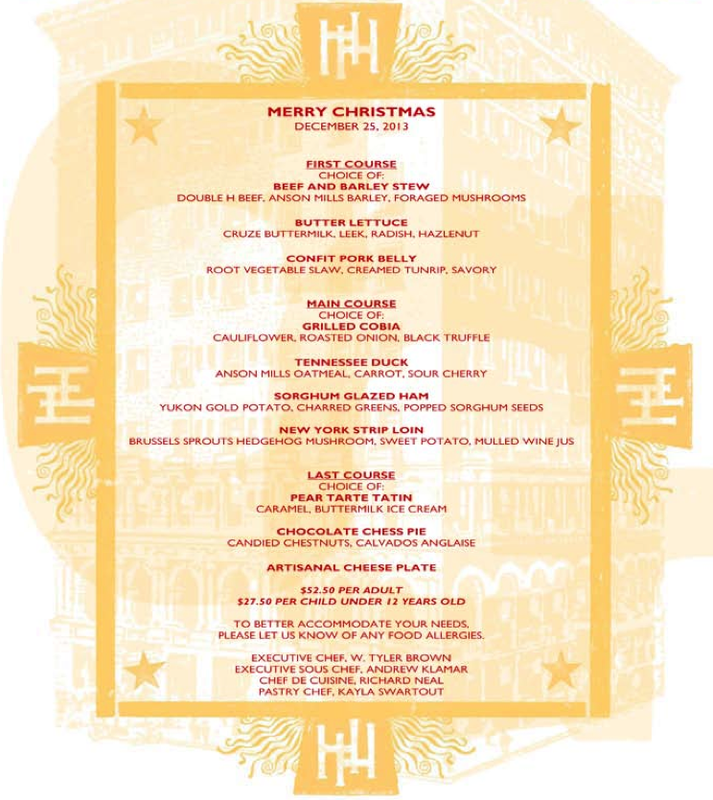 Our doors will be open Christmas day for brunch and dinner. In addition to the Christmas lights spilling out of our lovingly decorated lobby and grand ballroom, smells of Christmas favorites will fill the hotel. Join us for brunch or dinner and enjoy holiday favorites from Executive Chef Tyler Brown, Executive Sous Chef Andrew Kalmar, Chef de Cuisine Richard Neal and Pastry Chef Kayla Swartout. Brunch will be held from 11 a.m. to 3 p.m.
Dinner will be held from 5 p.m. to 10 p.m.
You can download the menus online by visiting our website. Reservations are required (and going quickly! ), so give us a call today at 615-345-7116. If you’re not able to join us on Christmas day, stop in sometime over the holidays. Take a step inside, warm up (we’re also offering snacks of spiced hot tea and Christmas cookies in the lobby) and take a look around our Christmas decorations. As you ascend the staircase into the lobby and see the decorations, you’ll get that warm, fuzzy feeling your remember from childhood. Just around the corner, the grand ballroom is also decked to the nines. Share your photos of the decorations with us on Facebook and tag us on Twitter and Instagram at @HermitageHotel.